Gig Harbor waterfront 2014’s sales nearly equaled 2013’s record-breaking year. 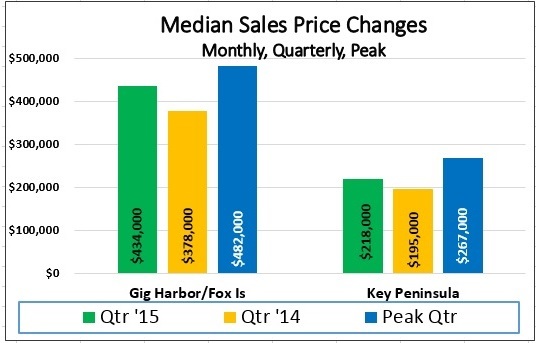 But the real news is the 18% increase in median sales price for Gig Harbor waterfront. Half of all sales were more than $600,000 and half less. Gig Harbor waterfront sales prices peaked at $900,000 in 2007–now at 2005 levels. 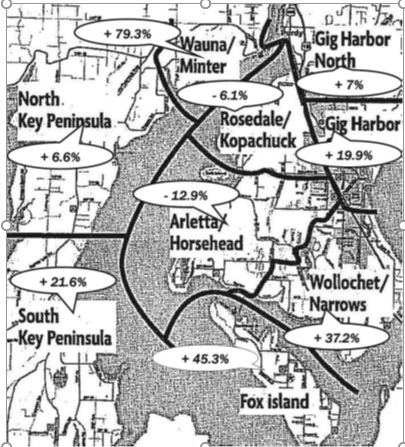 But the sales pattern for Gig Harbor waterfront was atypical—the market slowing precipitously 4th quarter 2013, continuing through the entire 1st half of 2014. By July Gig Harbor waterfront sales were markedly down–both price & number. Not surprisingly, all 23 $1m plus sales occurred in Gig Harbor & Fox Island. But what was noticeable was the buying intensity 4th quarter in the upper end. Only 6 Gig Harbor waterfront offers were accepted in the entire 1st half, 7 in the 3rd quarter & 9 in the 4th, mirroring consumer confidence. 10 of those 23 sales closed in November & December alone. $655,000 was the high sales price for Key Peninsula. What a difference a year made in the over $1m tier for Gig Harbor waterfront. 2013’s record sales volume produced the smallest percentage (10%) of sales over $1m & the lowest median sales price ($490,000) since 2004. But 2014’s nearly equal numbers showed a healthy uptick of 17% high-end sales with 18% increase ($600,000) in median sales price. The current slim inventory of Gig Harbor waterfront—coupled with historically low interest rates & easier financing should keep prices rising in 2015. Median list price of the 38 homes in Gig Harbor/Fox Island is a shy $1m & in Key Peninsula $435,000 for the 18 homes listed. 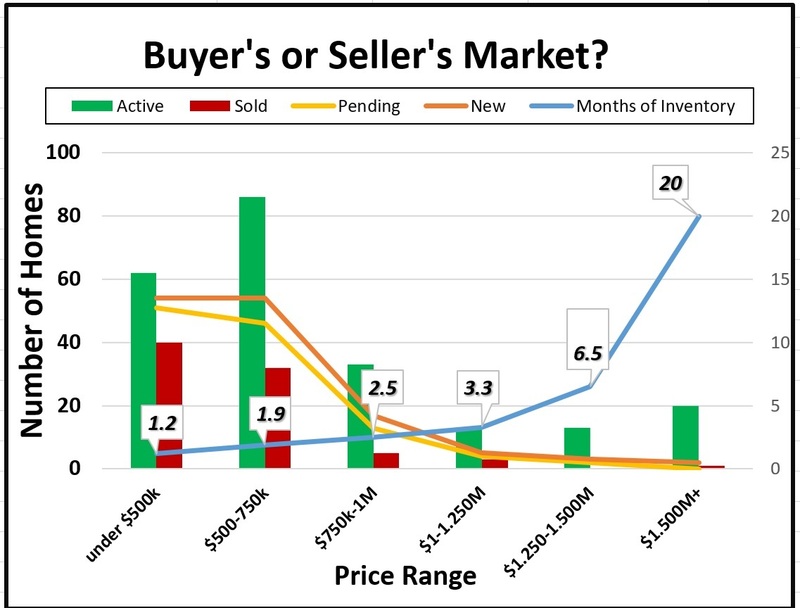 On the other hand, if an abundance of “pent-up sellers” list, it could hold down prices. I calculate a minimum of 250 Gig Harbor waterfront owners are ready to move—if market conditions (prices) permit. Gig Harbor waterfront homes $1m plus sold on average for 150% of assessed value in 2014. Average frontage was 102 feet, considerably down from 170 feet the year before. Only 5 had more than 125 feet. 50% had docks or dock permits & 85% were low to medium-low…nothing unusual here. Homes $750,000-1,000,000 sold on average for 120% of assessed value. Distressed Gig Harbor waterfront home sales are becoming nearly a non-issue—just 2% of the sales last year were short-sales and 5% were bank-owned, down 9% & 13% 3 years ago.